Tea is my hubby and princess favorite; given a choice they prefer that, on the contrary I am a coffee person. Love to sip my coffee and starts my morning with it. Nowadays in the evening I have dropped my coffee and changed to tea as majority prefers tea. I also love black coffee and picked up the taste for that from my mom who used to make it often. Black tea is rare in my household. Then you will be wondering why I made black tea, and yes this not normal black tea, it is famous in northern Kerala, where they drink this tea after a heavy meal like biriyani. Some also prefer to start their day with this tea. Whereas in other parts of Kerala you can get “Kattan Chaya”/ black tea without any add on. Similarly this tea is also called as ‘ghava’ and is popular in Hyderabad city. Sulaimani tea has a history that it has been drunk by Prophet Mohammed with dates and black pepper added to it. Later Arabs inherited the tradition of drinking ‘ghava’ but with some slight changes. They made use of sugar and called it Sulaimani. In one of the latest Malayalam movies (my hometown language) the hero and his grandfather drink this Tea. The reviews of the movie say that it is good movie. I had no knowledge about this tea until I saw the movie. 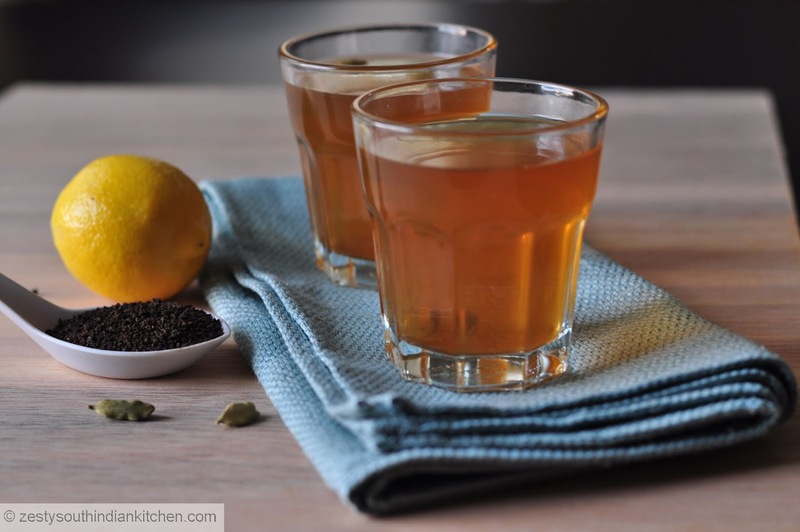 Then I searched Sulaimani tea got the recipe and also story behind it. I also wanted to try Sweet N Low sweetener in a beverage as part of Daily Buzz Food Taste maker program. So I decide to use Sweet N Low instead of regular sugar in Sulaimani tea. I made tea using loose black tea, but you can also make it with tea packets. I also added lemon juice, and cardamom to this tea. 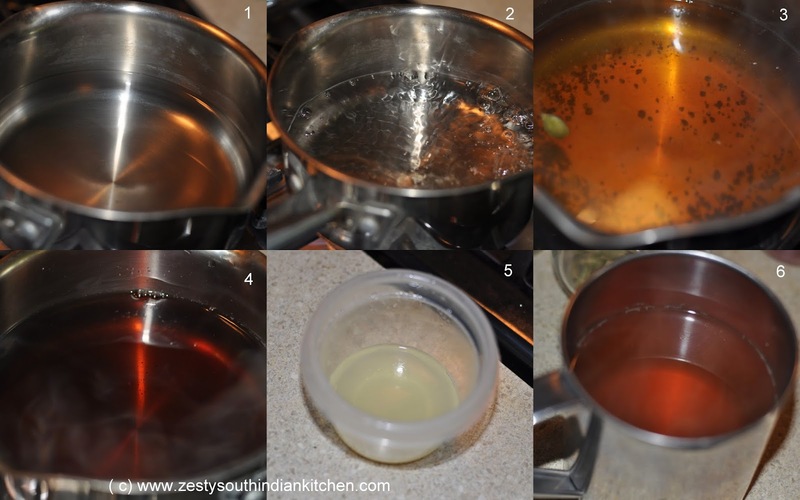 It is simple easy tea you can make it in less than 5 minutes. Only time required is for boiling water. If you are ice tea drinker, you surely are going to love this. You can sip it at any time of day. I read that this helps in digestion, and as I used Sweet N low sweetener it has zero calories. You can also add your favorite spices. Thanks to Food Buzz and Sweet N low sweetener to give this wonderful opportunity in helping to discover a favorite drink. I got following goodies, Here goes the recipe. Grab tea, lemon and sweetener. In a medium sauce boil the water, once it starts boiling add loose tea and one cardamom and set aside for 5 minutes. Then to this add lemon juice and sweetener and strain . 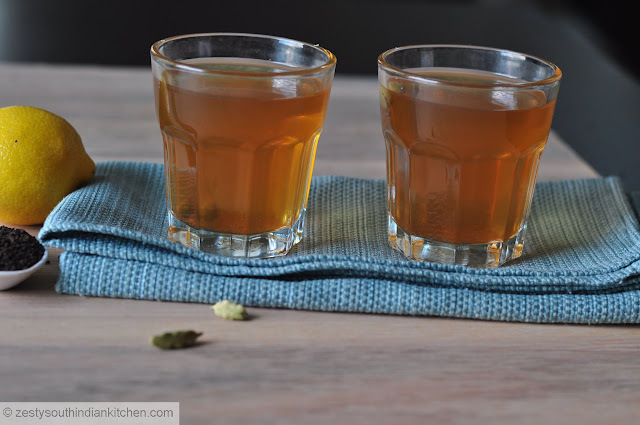 Transfer to serving glass with one cardamom on each. In a heavy-bottomed pot, heat water. When it starts boiling add loose tea and switch off the flame. Let set aside for 5 minutes to tea to sweep in. Add lemon juice and Sweet N low sweetener and serve with 1 cardamom. You can use cinnamon, cloves or mint instead of cardamom. I am linking this to Hearth and Soul blog hop hosted here. My favourite lemon tea. Very useful step by step & neat documentation Swathi. So easy to make it..
Like you i am also coffee addict..but recently changed to Tea as majority people in my house likes to drink only tea. My hubby loves this tea…especially after a biriyani. an awesome drink that helps digest. nice post and great clicks. first time here, do visit my space too when you get the time..
By the way the movie is Ustaad Hotel right? Its an awesome movie! You are right, Ustadd Hotel. I luv sulaimani. My kannur bread hubby luvs it too. wow..refreshing one,my husband’s fav too!! refreshing and soothing sulaimani tea.Since I have lived in the middle east,I have tasted this tea many a times. I start and end my day with tea! I love it too. This is a special treat with the lemon and spice. Delicious! Love the idea of a simple but flavorful tea. I will try this for my morning breakfast but with organic sugar. Wat a flavourful and excellent drink, simply love it. My fav drink too. This version is normally made and added in some ice cubes. Its so refreshing and breathtaking. Yes, you have to develop a taste for black tea. But works great for an after meal drink. Does wonders for the stomach! Actually, I do love black tea and buy it at the Asian market. I love mine with honey and lemon, and prefer to drink it hot. As for green tea, I adore green tea ice cold! Great tea, Swathi, and love your photos…as always! I make a gallon of iced tea with 16 black teabags, 20 grains of saccharin 2 cloves and a half cup (4 fluid ounces) of lemon juice. Sometimes I add fresh mint leaves to the boiling water. I love coffee, not hot tea so much but love iced tea. Funny, but I don’t care for iced coffee. As I write this I am sipping tea. Tea is so refreshing in the summer! Cardamon makes such a lovely addition. I have never thought of combining lemon and cardamon before – delicious idea! I’ve never tried putting cardamon in tea before. I will try this recipe the next time I am in the mood for tea! Wat a Coincidence! Even I watched that malayalam movie (Ustad Hotel) and was looking for Sulaimani Tea Recipe. I just love my Sulaimani..with a dash of cinnamon bark…! Heaven!